A society formed for the dissemination of Jewish literature, and the first of its kind in the United States; founded at Philadelphia in 1845 by Isaac Leeser. The same year an auxiliary society was established at Richmond, Va. 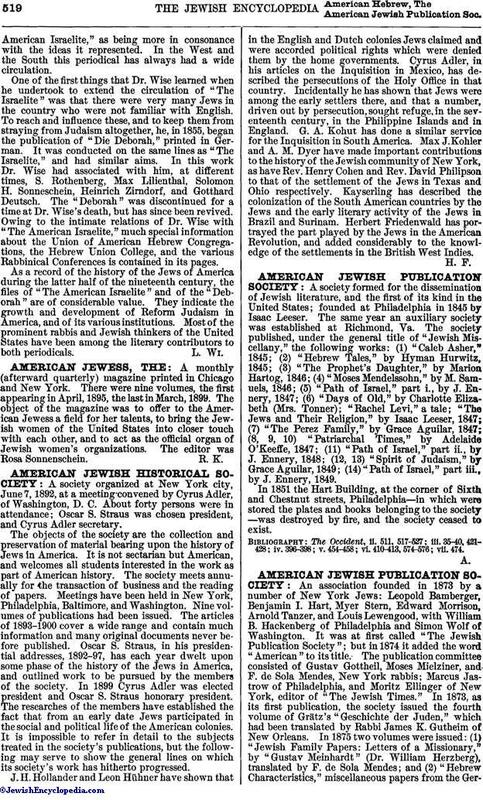 The society published, under the general title of "Jewish Miscellany," the following works: (1) "Caleb Asher," 1845; (2) "Hebrew Tales," by Hyman Hurwitz, 1845; (3) "The Prophet's Daughter," by Marion Hartog, 1846; (4) "Moses Mendelssohn," by M. Samuels, 1846; (5) "Path of Israel," part i., by J. Ennery, 1847; (6) "Days of Old," by Charlotte Elizabeth (Mrs. Tonner); "Rachel Levi," a tale; "The Jews and Their Religion," by Isaac Leeser, 1847; (7) "The Perez Family," by Grace Aguilar, 1847; (8, 9, 10) "Patriarchal Times," by Adelaide O'Keeffe, 1847; (11) "Path of Israel," part ii., by J. Ennery, 1848; (12, 13) "Spirit of Judaism," by Grace Aguilar, 1849; (14) "Path of Israel," part iii., by J. Ennery, 1849. In 1851 the Hart Building, at the corner of Sixth and Chestnut streets, Philadelphia—in which were stored the plates and books belonging to the society—was destroyed by fire, and the society ceased to exist. The Occident, ii. 511, 517-527; iii. 35-40, 421-428; iv. 396-398; v. 454-458; vi. 410-413, 574-576; vii. 474.